Ship Weight : 36 lbs. Sourced exclusively from natural ingredients and flavors, Guittard White Chocolate Sauce is low fat and contains no high fructose corn syrup. Fits any drink or dessert. Comes as a case of four 90oz jugs. INGREDIENTS: Milk, Sugar, Cocoa Butter, Real Vanilla, Potassium Sorbate (a preservative). 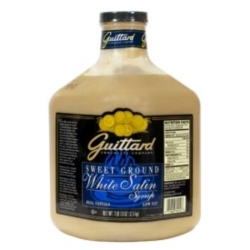 Guittard's white chocolate sauce has a smooth flavor with rich, authentic vanilla; no imitations! All-natural ingredients - no artificial additives!